Is Your Metal on Metal or Modular Hip Implant Causing You Pain? Was an Implant Removed That Raised Cobalt Levels in Your Body? Your rights and fair compensation are our top priority. We can assist you in exercising your rights by demanding manufacturers and suppliers of your implant pay for your revisions, loss of quality of life, inconveniences and pain & suffering. Fill out the simple contact form to the right to receive a call from one of our experienced attorneys to discuss your case. There is no obligation or commitment for filling out the form and you will be contacted promptly to discuss your claim. If you are unsure of the type of hip implant you were fitted with, we can help you determine the model and manufacturer. 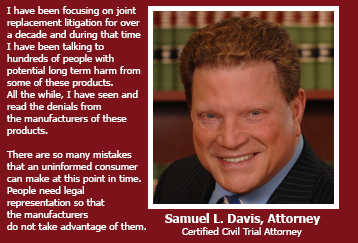 We believe you should know all the facts before you file your metal-on-metal hip claim and decide whether or not you should hire an attorney to protect your rights. Don’t get taken advantage of and settle for less then you are entitled to. Results may vary depending upon one's circumstances. Hiring a lawyer is an important decision that you should consider carefully. No aspect of this advertisement has been approved by the Supreme Court of New Jersey.